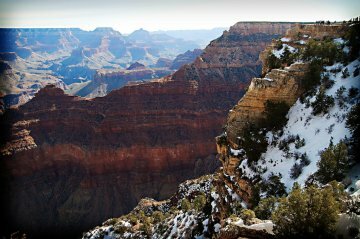 “To experience the canyon, you have to leave the rim.” And winter might be the best time to do it. THE GRAND CANYON is one of those ultimate family summer roadtrip destinations. I can picture the South Rim parking lot filled with cars with colorful license plates, heat ripples bending up from hot metal, RVs wedged into oversized spaces, and crowds camera-snapping at the overlooks. Okay, maybe that scene plays out in winter too. Actually, back in February of 2007, I was one of those cars, one of that crowd. So I can report that, when it comes to the through-visitor, the overlook-tourist, the Grand Canyon has no low season. Most importantly, almost no one hikes into the canyon in winter. During Shukman’s 3-day trip with his 8-year-old son, they only saw 20 or so other visitors. It’s cold — as opposed to sweltering. It’s nice to walk out of the shade and enjoy the warmth of the sunlight instead of cursing its heat. There may be snow and ice on the upper reaches of the trails, but once you get down a ways, it’s warm and sheltered enough that slipperiness isn’t an issue. Shukman’s piece has a rundown of lodging options, including the Phantom Ranch, which has dorm beds and is actually located at the bottom of the canyon. For route info, it’d be best to check out the National Park Service‘s maps. 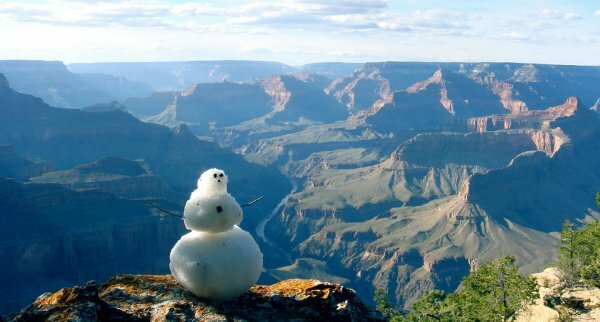 If the idea of the Grand Canyon in winter inspires you to make the hike (I know I’m thinking about it), or if you have in the past, share your experience in the comments. Find out why Trips thinks the Grand Canyon is one of The World’s Richest National Parks. You can also read one Matador member’s take on the new Grand Canyon Skywalk.